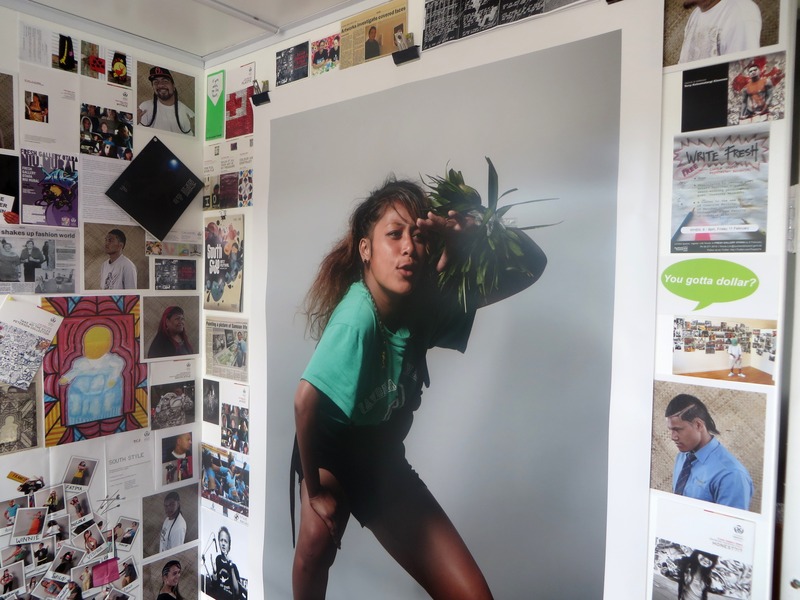 The OTARAcube is a permanent exhibition space in the Otara Town Centre; it is a 10×10 foot customised container gallery managed by Manukau Institute of Technology Faculty of Creative Arts developed with support from the Otara-Papatoetoe Local Board. A week-long event called Proudly Otara is taking place in the Otara Town Centre this week and to mark the occasion, I’ve installed a quick pop-up exhibition showcasing photos, posters, fliers and artwork from community art events that have taken place in and around the Otara Town Centre over the past decade. The material is from both my own and Fresh Gallery Otara’s archives; the Gallery’s programming since 2006 is well represented, but there is also material from Fresh Gallery Otara’s predecessor, Artnet Gallery, which ran up until 2004 and was managed by Wahine Malosi Charitable Trust. Artnet Gallery was where I cut my teeth as a curator; it was a foundation that embedded a sense of community arts service delivery and relational accountability deep into my psyche. This past week, I was interviewed by Justin Gregory for Radio New Zealand’s weekly arts programme, Standing Room Only. In January, I presented some concerns to the Mangere-Otahuhu Local Board of Auckland Council regarding the exhibition programming at Mangere Arts Centre, a community arts facility in the Mangere Town Centre. I’m concerned with the disconnect regional arts programming has with local communities under the unitary Auckland Council and that there are no public opportunities for feedback or dialogue between those who produce local arts programming and the audiences they supposedly serve. The Mangere-Otahuhu Local Board were responsive to the concerns I raised saying that similar sentiments were felt both within the Board and from community members; they planned to follow up with Auckland Council’s Arts and Culture unit to respond but as yet, I’ve heard nothing. The Manukau Courier published a story and since then, I’ve received a huge amount of support from South Auckland residents who believe strongly in what was said. Interestingly, I listened to this whilst installing the Proudly Otara exhibition at the OTARAcube. Whilst the exhibition only represents a sliver of the arts and cultural events and activities that have happened in and around the Otara Town Centre since 2003, there is an overarching theme of community accountability and ownership. The voice and visibility of community aspiration and pride is at the forefront of what I’ve been fortunate enough to produce and be involved with during my time here in Manukau, South Auckland. For people who live and work here, a connection to this community is not as simple as catching a “South Auckland bus” (Hanna Scott) and relational accountability is demonstrated in action, not just words. I’m happy that from a blog, which led to a presentation to the Mangere-Otahuhu Local Board, that inspired a story in the Manukau Courier, a national radio discussion about Auckland Council’s accountability to the Mangere and wider Manukau community has happened. I’m also developing an article for an upcoming issue of The Vernacularist on the theme of community and relational accountability – watch this space! Proudly Otara starts today in the Otara Town Centre and this morning, Toakase Women’s Group have presented an impressive display of Tongan hand-crafted adornment. There are performances, displays and activities scheduled for the Otara Town Centre stage areas throughout the week; check out the Otara Business Association Facebook page for more details.